This was an unputdownable read, but tough at the same time. Not because the language is difficult, but because it doesn’t reflect well on our society and makes for uncomfortable reading. Thirteen year old Joe is left alone while his mother and her boyfriend go on holiday to Spain during half term. Although initially he seeks pleasure in his freedom – eating what he wants and playing for unlimited amounts of time on his Xbox, it soon becomes apparent that not only has he not been left enough provisions and money, but that he is lonely, ignored and certainly not mature enough to deal with his situation, despite his best attempts. 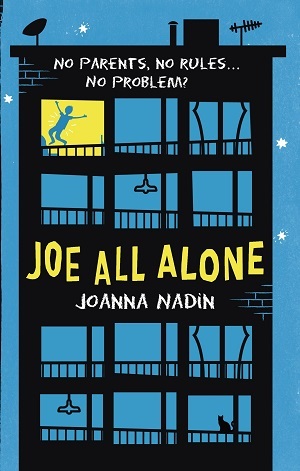 He’s an exceedingly likeable character, and Joanna Nadin has captured the feelings and thoughts of a 13 year old boy very well. Told in day by day instalments, not exactly like a diary, but documenting the passing of time for the reader, Joe eventually makes friends with a fugitive girl, Asha, who’s sheltering at her mock grandfather’s flat across the way from Joe’s. This affords him some contact, and draws the mock grandfather’s attention to his plight. The story pulls out some modern dilemmas. Joe describes his neighbours to us, but it’s clear that there is no real community among them. He also points out traits about his school – the attempt to explain budgeting to the children, the interested concern of one teacher, the role of bullying outside the classroom, as well as the wider agenda including the perceived implications of going ‘into care’, troubled children, and of course the first spark of feelings with a girl. Saying that, there are wonderful touches of humour which lighten the atmosphere, and Joe is a reader, which comes across in his references to Huck Finn and fairy tales. From both of these, and Joe’s friendship with Asha, the reader is left with a feeling of hope and uplifted spirits in what can be changed, and what can be imagined. I would also make one last remark – the cover for me was slightly misleading – it shows a boy seemingly jumping on his bed with joy, and bears the strapline ‘No parents, no rules, no problem?’. Although I can see how this does depict the story, I would be wary that the cover portrays it more as a ‘Home Alone’ type venture, whereas in actual fact this was quite a dark moral tale for our times. You can buy it here from Waterstones, or see the Amazon side bar.